Pam’s Pictorama Post: Halloween happiness continues on Pictorama! This is a rare case of a card that I have absolutely no memory of having purchased. I have owned it for a fair amount of time, and suspect someone must have given it to me. Halloween cards are frequently too expensive to purchase without real commitment. This card was sent from Madge Bush of Branchport, NY, tardy for Halloween, on November 5 at 5 PM, 1909. Written in a virtually unreadable child’s hand is the following: Hellogertrude wasyouinto mischief halloween Howdoyoulike yourteacher? It is address in the same hand: Gertrude Bush Westfield PA R.F.D. #2. An adult with beautiful penmanship has added with flourishes: Gertrude Lulu Bush and under the child’s writing her name, Madge Bush. In addition, and somewhat inexplicably, Bush, G.B.x M.B. L.B. and again, Madge Bush. I think this card is hotsy-totsy! Although it is missing the ever-desirable black cats, it is a worthy, goofy image. For some reason the Devil has entered into a party favor tug-of-war with Mr. Pumpkin Head. (I confess, Pumpkin Headed figures have always vaguely terrified me.) The Devil has put down his pitchfork in order to really put his back into it. We will assume that maybe Mr. Pumpkin Head was carrying those two oozy looking small pumpkins – a strange potential form of Pumpkin cannibalism he was about to commit? I have long waited to be invited to a party where favors like this party cracker were given out – what on earth great thing could have been inside? Perhaps I will never know, but these guys consider it worth fighting for. 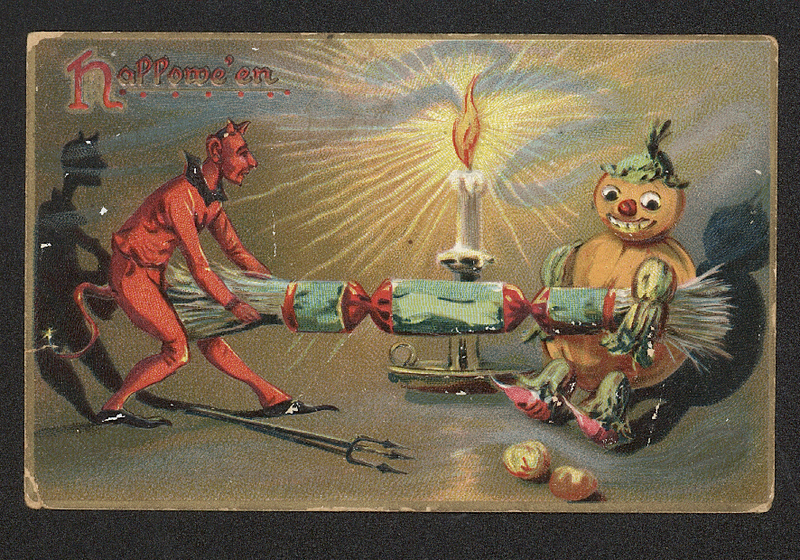 Another thing that appeals to me about this card is the way the candle gives everything a scale – the Devil and Pumpkin Head are party cracker/candle size! Let’s all get out there and mail a few Halloween cards – and don’t forget the party crackers in my trick or treat bag please. Pam’s Pictorama Photo Post: Meet Tommy, sitting by a fishbowl on a window sill, pretty as a picture. The back of this card has the following written on it, Dear Lina, here is a picture of old Tommy he is a live [sic] and well. Gay said he did not think he could get away tomorrow. Give our love to Mrs. Brady and sister. It is addressed to Mrs. Pauline Bauldwin, New Milford, PA Route no.1 Dated October (illegible date) 2 PM 1908. It is written in pencil, except the address which is in pen – it is a neat script. Unsigned – I guess Lina knew who was writing. The photographer had an excellent eye and this is a great photo. Most notably the wonderful reflection in the fish bowl – a little universe unto itself showing a trim yard and house in tiny replica. I can’t actually see a fish, but there is a large and interesting shell evident in the fish bowl and I wonder what book it is sitting atop of, but nothing on the spine. Old Tommy is a hefty fellow. He is dignified and not even giving that fish bowl a sideways look – at least not while the camera is on him. Another of my cat stories from my youth is about a tabby stray named Zipper. My mother rescued him as a tiny, malnourished kitten being abused by boys outside a laundry mat. 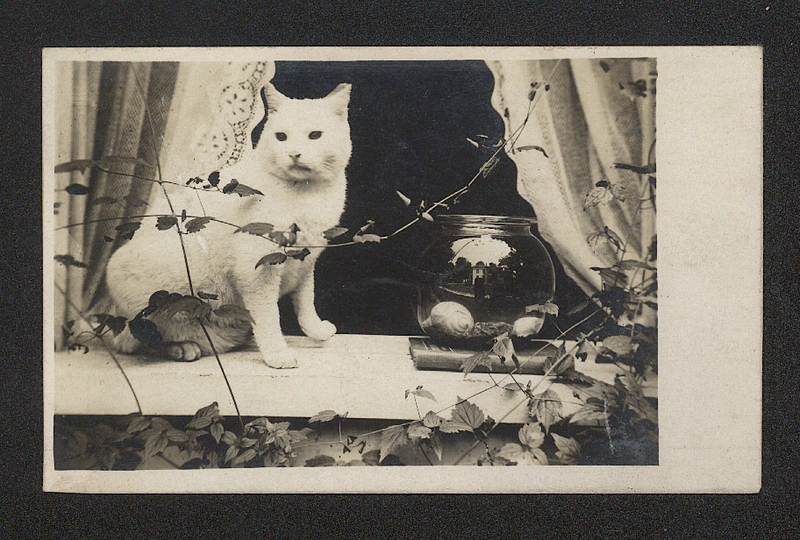 Anyway, Zips was a hunter and feral fellow and, additionally, a great admirer of the large tropical fish tank we kept. Zipper liked to sit next to it, eyes shining with interest, and he would gently pat it intently, while looking at us innocently. To my knowledge no fish fell prey to Zipper (we did have a top on tank although it had an opening), but it was a large tank and who’s to say really if he had the occasional fish nip or not? Pam’s Pictorama Post: Happy New Year! Featured here is a small clutch of New Year’s cards that I purchased last year while contemplating the then New Year ahead. The ever sensible French have a cultural preference for New Year cards over Christmas cards – thus allowing themselves more time to enjoy the holidays. I have two examples from France above and two are British. 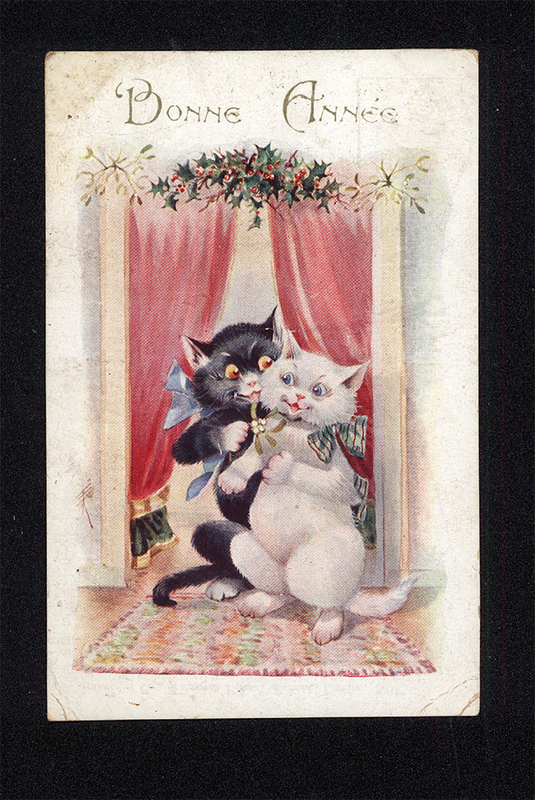 Evidently dancing black cats were all the craze for ringing in the New Year in the 20’s which is the period of these cards, ’29 (black and white cat) and ’25 (three black kitties) are the postmark dates on those that were used. 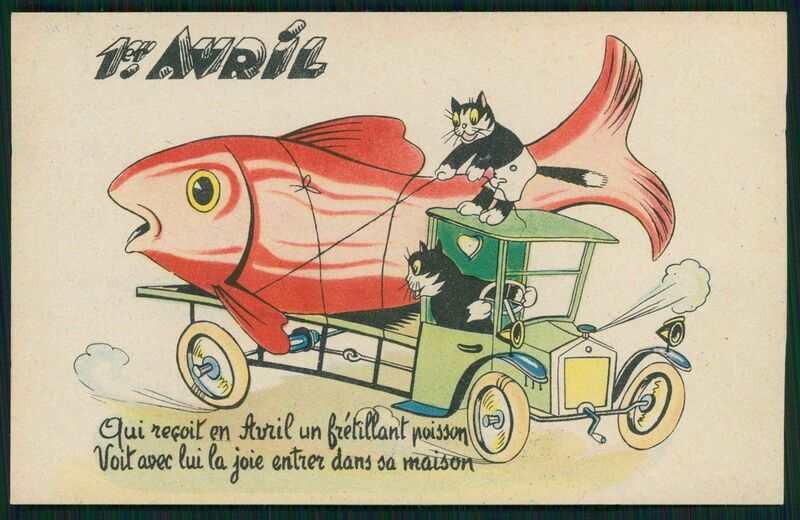 The Bonne Annee card is dated December 27, 1929 and is addressed to Mademoiselle Dora Cordova, L’rue Guy-Patini, Paris, X. The brief message, as closely as I can read it, is Meilleurs voeux et vous (?) souvenirs, Yoorssie (?) Lehmann. The other, in English, is dated 4:45 PM, December, ’25 but the day is obscured. 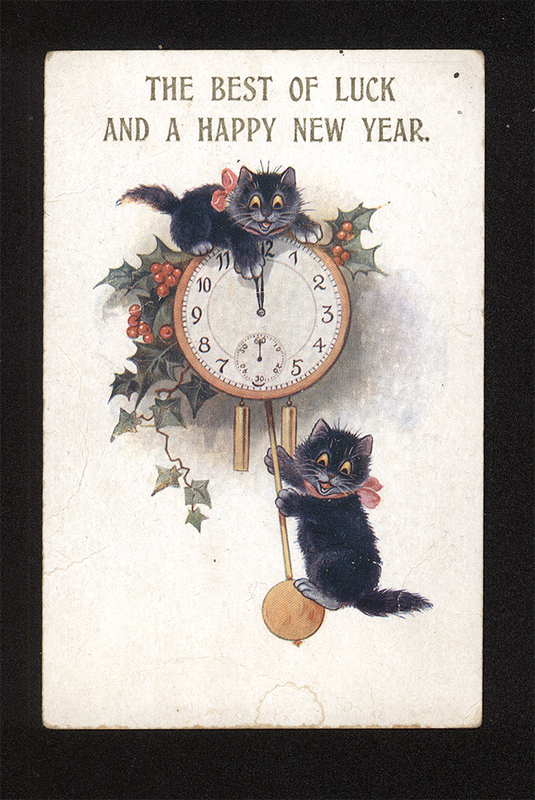 It says, From your Loving Sister in Law and Family with best wishes for the new year and better Luck. From Ada xxxxxx. It is addressed to Mrs. Thornton 22 St. James Street, Walthamstow. I love the tubby black kittens – especially that party trio! But my favorite is the very mischievous brown and white fellow. He has a sort of Devil-may-care Maurice Chevalier charm about him. Quite a New Year’s bash at his house! Something makes him just short of cute. While I don’t think I am capable of tossing my habits aside and moving to New Year’s cards, I like the thought. Non-denominational well wishes for the coming year make more sense and cards arriving during the brief lull between Christmas and New Year’s or just beyond seems nice. As a small child I was always quite serious about the changeover in years – solemnly writing down resolutions, something I no longer do. Somehow I approach the whole affair with some trepidation as an adult. 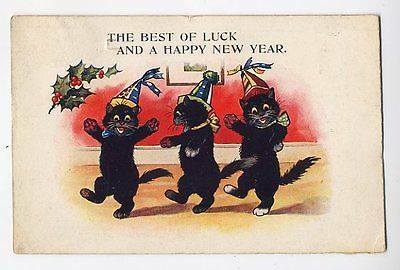 So, crossing my fingers and hoping for the best, here’s to 2015 to one and all!